FAPI-CLEVER-FLEX is a newly developed, very versatile and flexible brush sanding system for the most modern metal and wood processing. 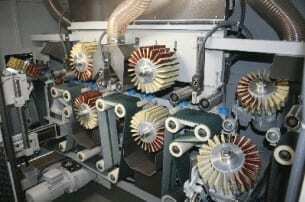 Flexible abrasive brushes made of abrasive cloth and bristles are inserted into plastic cores with dovetail grooves. The main task of the bristle backing behind the abrasive cloth is to generate a relatively high grinding pressure on the workpiece even at slow speeds. FAPI-CLEVER-FLEX offers more than 1,000 possibilities to put together the right brush sanding system for the respective surface finishing task. 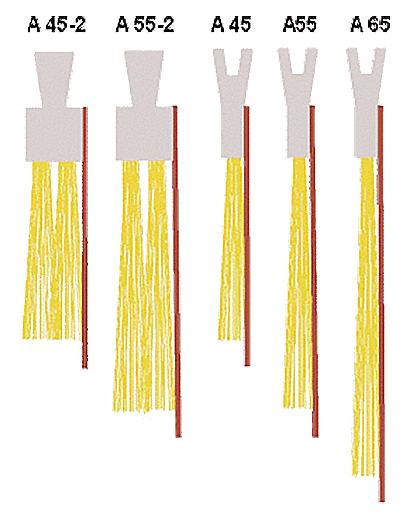 The abrasive brushes can be produced in different lengths, with different slotted abrasive cloth in different grit sizes and with different brush fillings. The grinding brushes can be changed very easily after use. 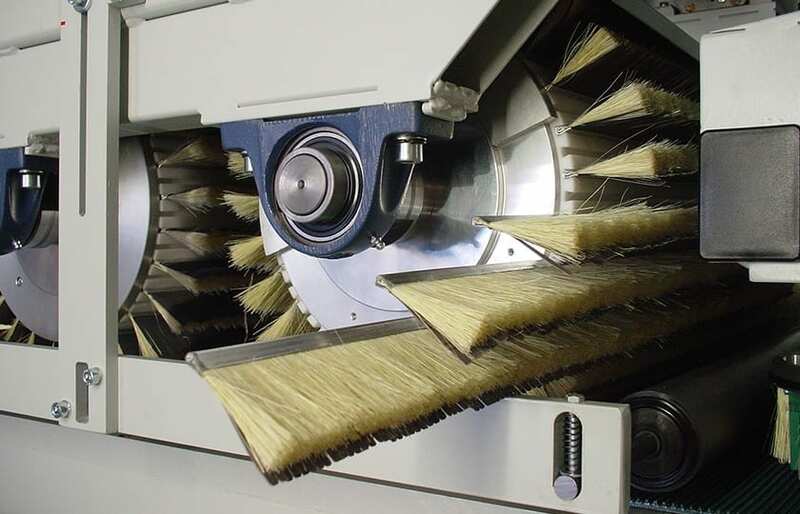 Thanks to the split end caps (optional), the grinding brushes can be changed within seconds, reducing machine set-up times to a minimum. The plastic body can be produced in diameters of 54 mm, 80 mm, 105 mm, 125 mm, 150 mm, 180 mm and 280 mm and in any length. Compared to basic bodies with permanently installed abrasive cloth flaps and bristles, the service life is almost 100% longer because it can be used again and again. Dovetail grooves are made in the base body for milling the brush sanding strips. The basic body can be designed with a straight milling or a spiral 9° milling. The spiral design has the advantage of smoother running, as the workpiece can be machined evenly “softly” over a larger area. In the straight version, the use is more aggressive and therefore often more unsteady in the machining process. The PREMIUM FAPI-CLEVER-FLEX system is the highest quality system in our Clever-Flex brush sanding series. The bonding of high-quality abrasive cloth and Tampico Fibre bristles in an aluminium strip achieves maximum abrasive performance processes with an extremely long service life. The edge of the abrasive cloth lamella in the aluminium base makes it extremely mobile and flexible over its entire length during the machining process. In order to avoid scratches on the workpiece, the ends of the abrasive cloth flaps are rounded. With the PREMIUM system, deep profiles can be machined with relatively short flaps and high grinding pressure. Bristles: Standard is Tampico Fibre, on request we also use other bristles such as horse hair. By adding pure support brushes, the aggressiveness of the brush grinding system can be greatly altered. 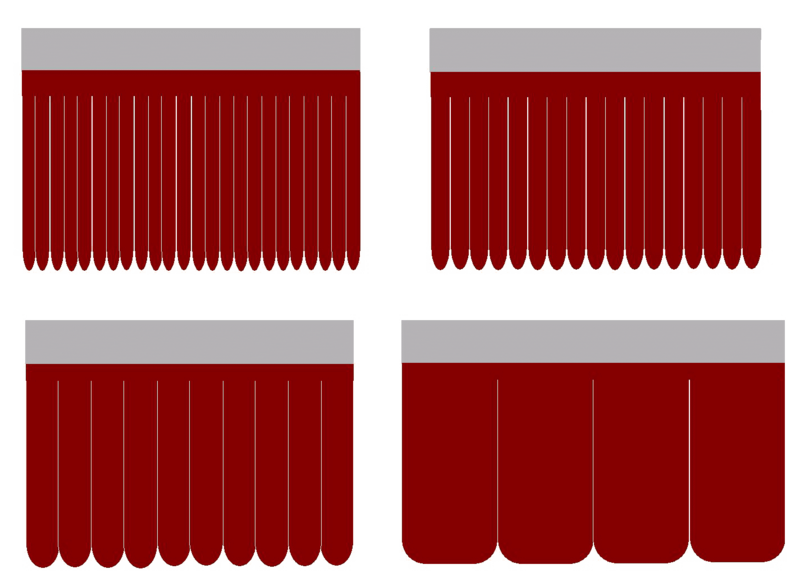 The support brushes can be produced in single row (soft) or double row (hard) design in various bristle lengths. The ADVANCED FAPI-CLEVER-FLEX system is a cost and benefit optimized system of our FAPI-CLEVER-FLEX brush sanding series. The same high-quality abrasive cloth and Tampico Fibre bristles are used as in the PREMIUM FAPI-CLEVER-FLEX system. However, here the Tampico Fibre bristles are clamped into a plastic strip on which the (slotted) abrasive cloth is glued with a high-tech adhesive. As a result, this system is not quite as flexible and stable as the PREMIUM FAPI-CLEVER-FLEX brush sanding series, but with decisive advantages over abrasive cloth flaps with rigid carrier lip or bonded bristles. By adding pure support brushes the aggressiveness of the brush grinding system can be greatly changed. 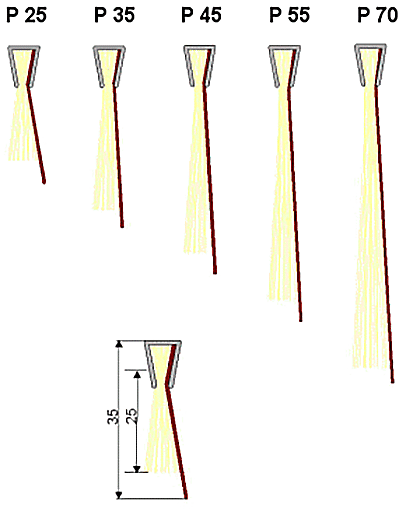 The support brushes can be produced in single row (soft) or double row (hard) design in various bristle lengths.